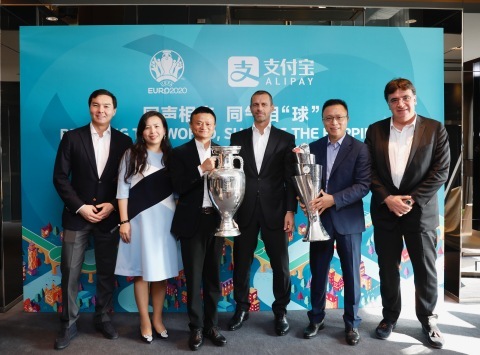 UEFA and Alipay, the world’s leading payment and lifestyle platform, operated by Ant Financial Services Group, are proud to announce a new eight-year global partnership for all UEFA national team football competitions from 2018 to 2026. Official Global Digital Wallet and the Official Global FinTech Partner, for all men’s national team events, including UEFA EURO 2020 and UEFA EURO 2024. The partnership was established with the support of China’s sports business market leader Shankai Sports. Its objectives are, among others, to deal with all issues relating to European football, to promote football in a spirit of unity, solidarity, peace, understanding and fair play, without any discrimination on the part of politics, race, religion, gender or any other reason, to safeguard the values of European football. UEFA also promote and protect ethical standards and good governance in European football, maintain relations with all stakeholders involved in European football, and support and safeguard its member associations for the overall well-being of the European game. Ant Financial Services Group is dedicated to using technology to bring the world equal opportunities. Our technologies, including blockchain, artificial intelligence, security and computing. This empowers us and our partners’ ecosystem to serve the unbanked and underbanked, bringing more secure, transparent, cost-effective and inclusive financial services to individuals and small and micro-sized customers and small businesses worldwide. Ant Financial has formed international partnerships with global strategic partners to serve local users in those markets, and we serve Chinese travelers overseas by connecting Alipay with online and offline merchants. Brands under Ant Financial Services Group include Alipay, Ant Fortune, Zhima Credit, MYbank and Ant Financial Cloud. Operated by Ant Financial Services Group, Alipay is the world’s largest mobile and online payment platform. Launched in 2004, Alipay currently works with over 200 domestic financial institution partners. Over the years, Alipay has evolved from a digital wallet, to a lifestyle enabler. Users can hail a taxi, book a hotel, buy movie tickets, pay utility bills, make appointments with doctors, or purchase wealth management products directly from within the app. In addition to online payments, Alipay is expanding to in-store offline payments both inside and outside of China. Alipay’s in-store payment service covers over 40 countries and regions across the world, and tax reimbursement via Alipay is supported in 29 countries and regions. Alipay works with over 250 overseas financial institutions and payment solution providers to enable cross-border payments for Chinese travelling overseas and overseas customers who purchase products from Chinese e-commerce sites. Alipay currently supports 27 currencies. CAA Eleven is the exclusive marketing agency of UEFA appointed to manage commercial rights to UEFA national team football competitions, including the UEFA Nations League; the European Qualifiers; the UEFA European Under-21 Championship; UEFA Women’s EURO and the UEFA European Futsal Championship.